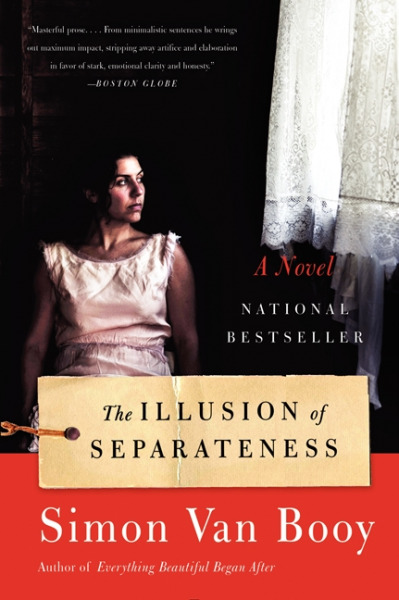 The characters in Simon Van Booy’s The Illusion of Separateness discover at their darkest moments of fear and isolation that they are not alone, that they were never alone, that every human being is a link in a chain we cannot see. This gripping novel—inspired by true events—tells the interwoven stories of a deformed German infantryman; a lonely British film director; a young, blind museum curator; two Jewish American newlyweds separated by war; and a caretaker at a retirement home for actors in Santa Monica. They move through the same world but fail to perceive their connections until, through seemingly random acts of selflessness, a veil is lifted to reveal the vital parts they have played in one another’s lives, and the illusion of their separateness. Define the phrase “illusion of separateness.” The author uses it three times—in the epitaph, as the name of a photo exhibit curated by one of the book’s characters, and as the book’s title. How do all three tie together? What is the author’s message to the reader about “separateness”? Is it a part of the human condition that we feel isolated and alone? Describe the ways in which all the characters in the novel are connected. In your group, have each member play the game “six degrees of separation.” What, if any, links do you share that you had not realized—or consciously recognized—before? Think about the various characters. How did their choices unite the circle of their connection? Focus on one. What might he or she have done that would have broken the link? Does it matter that at the end of the novel, the various characters do not recognize their importance to each other? Is it enough that you, the reader, understand the link between them? How do such invisible links shape our lives? At the beginning of the novel, after Martin discovers the truth of his existence, the author writes, “He had been reborn into the nightmare of truth. The history of others had been his all along.” What is the author conveying with these words? Amelia describes being blind. “Being blind is not like you would imagine. It’s not like closing your eyes and trying to see. I don’t feel as though I’m lacking. I see people by what they say to others, by how they move and how they breathe.” Think about this. Do you think that while sight affords us much, it also closes us off to other aspects of life, and makes us “blind” in another kind of way? Do you “see” with all of your senses? How can doing so change your perception? Amelia tells us that she believes, “people would be happier if they had admitted things more often. In a sense we are all prisoners of some memory, or fear, or disappointment—we are all defined by something we can’t change.” Do you agree with her? How are each of the characters defined by something they cannot change? How do they adapt to this defining element? What about your own life? Is their something that you cannot change that would like to? How do you cope with this? Discuss the origin of Mr. Hugo’s name. Is this an apt moniker for him? Is he reminiscent of a character from a Hugo novel? Analyze the structure of the novel. Why do you think the author chose this structure versus straight linear narrative? Would the story have the same emotional impact if it had been told from one or two character’s points of view alone? What makes this a novel rather than a collection of short stories? What was your emotional reaction to the book? Did you relate to one character more than another? What did you take away from reading The Illusion of Separateness?